Rabbits enjoy the company of other living beings. In addition to human friends, your rabbit may get along with another rabbit, house cat, guinea pig and well-mannered dog. All introductions should be closely supervised. It is important to let your rabbit choose his own friend. 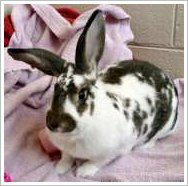 Click here to learn more about the dating service offered to let your rabbit meet the rabbits available for adoption at WHS. Your rabbit must already be spayed or neutered before arranging a date. Please do not simply bring a second rabbit home without allowing the pair to meet. Such rabbits are frequently returned when a bond is not made. It is important to let your rabbit choose his own friend. The best match is usually a neutered male and spayed female. Sisters who have always been together are always a good choice. A combination of two males is at best difficult, at worst impossible, even when both are neutered. Supervised companionship must continue once the pair is home. Two cages, a neutral space, considerable time and patience are all needed to succeed. Previously house trained rabbits may temporarily abandon the litter-box during the courtship period as they will feel the need to assert their "space." House cats and rabbits usually bond with the proper management. This is especially true if the rabbit is confident; often times a larger breed and will not run from the cat. In fact, many rabbits will boss their feline housemates, chasing them from a favorite spot. If the rabbit does run from the cat, introductions should take place with the rabbit in his cage. Or, hold the cat on your lap and allow the rabbit to investigate at his own pace. Do not match an adult cat with a baby rabbit. Cats who are allowed to roam outside are not a good choice with rabbits. If the cat is too aggressive to the rabbit or the rabbit is too frightened of the cat, do not allow them to interact! The dog must be a non-hunting companion animal that has been obedience trained prior to meeting the rabbit. Be cautious and never allow any breed of dog to interact with any small animal unsupervised. The first introduction should take place with the dog on a leash and the rabbit in a carrier or in his own cage. Allow the dog to enter the room and see the rabbit in the cage and reward him for gentle calm behavior. You can slowly work your way towards the cage if he remains calm on the leash. If he shows signs of anxiety or excitement, just remove him from the room immediately and avoid the use punishment of any kind. Try again later, as it may take several weeks before they are accustomed to each other's smell. It is important to reward the behavior you want and to halt inappropriate behavior. You can also let your dog smell the brush after you groom your rabbit and reward calm behavior. If your rabbit has been allowed on the floor in a room without the dog present, you can later let your dog into that room so that he can also get used to the rabbit's scent in on the floor. Then, you can put up a baby gate with the rabbit on one side and the dog on the other side (if your dog can jump a baby gate, have him on a leash as well) so that they can safely sniff noses. If you dog has remained calm up to this point, you can then do an introduction where he is on a down-stay and on a leash while someone else holds the rabbit. Allow your dog to slowly approach the rabbit, continuing to reward the positive behavior and removing your dog as soon as he shows signs of being excited or aggressive. The introductory period may last weeks or even months. Some rabbits may never feel comfortable having a dog near them. Some dogs may never see the rabbit as a family member and may always see the rabbit as a prey item. Use common sense! This is usually an easy match. Rabbits and guinea pigs generally like each other immediately or simply ignore each other. Supervise the first few interactions to make sure that there is no fighting. An agitated guinea pig will sway from side to side with teeth chattering. If this happens, it is best to separate them.